Ambient Weather WS-2902 Review 2019 – Do NOT Buy Before Reading! A weather station is one of the greatest devices to get alerted by the local weather conditions. The niche market segment that a weather station caters to is defined, more or less by academic individuals. Hence, one can confidently say that this bunch of consumers is an informed group. They know exactly what they want, how they want it and why they want it. A farmer may require a weather station with features like lightning detection, storm alert so that he can take pre-cautions steps on his farm thus it’ll save him from losing a lot of precious crops. How to Install Ambient WS 2902? A weather enthusiast may need a weather station to collect data’s like rainfall info, temperature, etc. He may also stream his weather in any one services and track the weather in real-time from anywhere through internet. For long, people have been searching for superior quality home weather stations. Taking this demand in high consideration, technical experts with the help of their skills and talent have introduced Ambient Weather (WS-2902). It is a fully featured weather station that has been designed professionally for residential weather enthusiasts. Like AcuRite, Ambient also combined all the important sensors into a single unit because it’s easier for the consumers to install and mount it. The sensor comprises of a 330ft wireless range to console and is powered by solar panels that charge a super-capacitor for operation all along. Batteries may be used as a back-up so that you may receive accurate measurements all along. Ambient Weather WS-2902 comprises a solar charged super-capacitor power source. It will permit your lithium battery to get used during night time instead of alkaline rechargeable batteries. Lithium batteries along with comprising long-time durability will keep working until the minimum temperature gets reached. Until and unless it becomes as low as -40 degree Fahrenheit, it will carry on with its job. The weather display of WS-2902 comprises a dark screen that is full of vibrant colors. It is a color film LCD display due to which you may expect to get the job done. As an AC adapter powers it, the show that you will be getting is crystal clear. Due to comprising of a narrow viewing angle, you need to take help of an expert prior getting it mounted on a wall. The components need to be within the range of your home wireless router so that it gets easily connected to the Wi-Fi. You need to confirm its placement so that the device astounds you with exclusive and accurate results. Weather forecasting done will let you take the best decision. Display console provides most of the basic information like wind speed & directions, rainfall data, outdoor & indoor temperatures. You can also set up a custom high-low alarms. Majority of the weather stations have the capacity to measure just five or six weather conditions. The WS-2902 is ahead of the others in this field. It’s a 10-in-1 weather stations that can measure; wind speed, rainfall, humidity, outdoor temperature, indoor temperature, UV, wind direction, temperature, barometric pressure and solar radiation. In terms of connectivity to external devices/platforms, the WS-2902 is a piece of real beauty. The superior Wi-fi connectivity enables it to send the data that it collects, wirelessly, to the Ambient Weather Network. Users also have the option to access one of the world’s largest online weather station hosting service in the world; Wunderground. You can tune the weather station according to your wishes. You can manage your weather station online through Ambient Weather Network. Hands down it has the best user-interface among other online weather streaming websites. For example: Set a particular weather condition that you are looking out for. Whenever the weather station encounters such weather conditions, you will be receive an SMS or Email notifying you of the change. If all that’s not enough, to further complement to its feature enriched body, the WS-2902 is compatible with Alexa and also works extremely well with Google Assistant. How cool is that? You can simply ask your Google Assistant and it’ll provide you all the weather information’s you need like these are some of the commands Weather Report, Outdoor Conditions, Indoor Conditions, Yesterday’s weather, 2016 Weather Conditions, etc. The WS-2902 can be connected to IFTTT and therefore, you can use it to control other external devices such as sprinklers, etc. A good weather station facilitates seamless and superior connectivity. Why? Because attributable to this connectivity, a weather station is able to provide the user with more accurate, reliable and flexible real-time updates. In short, as a user, you have access to all your weather-related data at the tip of your fingertips; on your mobile phone or PC. That’s exactly why this ‘connectivity’ factor of the WS-2902 makes it a very strong model. Compatible with imperial and metric units of measurement. Real-time wind updates; once every 16 seconds. Set independent alerts for specific parameters relating to specific weather conditions. Easy to measure temperature and humidity – This special type of device has created an easy measurement of temperature as well as humidity of both indoor and outdoor space. The measurements that we will get are on par with other types of devices. No effect of the turbulent flow of air – The vane that measures the direction of the wind in inclusive of a dampener. It helps a lot in the removal of bad effects of the turbulent flow of air. Rainfall measurement, easy task – It has become easy to measure rainfall. The tipping bucket mechanism has made the entire task a piece of cake. No need to worry about false reading related to rain. Even if the wind makes the weather station sway back and forth, there will be no fluctuation in readings. The setting of barometric pressure – You need to set the barometric pressure in a standard manner. You need to go through the weather report from the nearest airport. That particular number must be used to get through the calculation. Solar radiation measurement – Solar radiation is the measurement of solar power that reaches the earth. It is measured in watts per square meter. People having solar panels will find it handy. Even, a gardener will benefit from the same. UV light alertness – The measurement regarding UV light will alert you regarding hazardous conditions. It will let you stay away from sunburns and other harms caused due to too much exposure to sunlight. The ‘WS-2902’can send data in real time. This network of Ambient Weather is an ultimate design of a user-friendly network which is used for monitoring of your data over different levels/platforms. You can instantly view thorough information using the animated modules that are expandable. Outdoor as well as indoor conditions can be monitored. Conditions such as wind chill, rainfall, wind speed, barometric pressure, UV, wind direction, heat index, solar radiation, dew point, indoor temperature and indoor humidity and more. 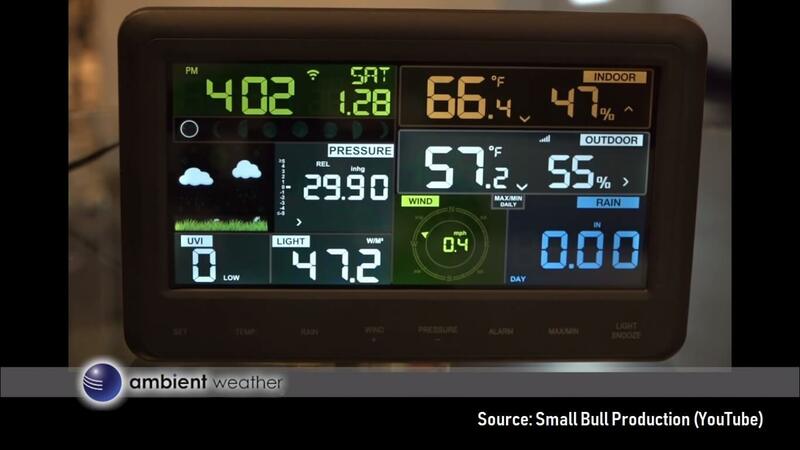 The newest Professional Ambient Weather's - Weather Station lets you monitor weather conditions of your backyard and home by LCD color, easy-to-read, brilliant display. Further, the option of enhanced Wi-Fi connection enables wireless data transmission from your station to the weather station, Weather Underground, which is the world's widest personal network. You can experience the comfort of owning your private weather information along with you anytime using your mobile device, tablet or computer. Along with the Wunderground, additionally support of this weather station is to upload onto the WeatherCloud. Data in Real-time can be sent to the Website of AmbientWeather.net. This website is the ultimate user-friendly type with a design for accessing your data over various platforms. You can instantly view thorough information along with the modules which are animated expandable type.This website also backs up text as well as email alerts. Weather data in real time is streamed by the Osprey (updates in about 1 minute) to the website of ‘WeatherUnderground.com’, which is the ultimate website around for storing and collecting exclusive data in real-time from the weather station. Data in real time can be sent to the website, ‘WeatherCloud.net’. The Weathercloud allows controlling of the device very easy as well as fun. The app can be accessed via your computer or smartphone or tablet. You can enjoy similar user experience using all the devices. Sensors of your personal weather station can be connected to the IFTTT network. This can administer devices that are external such as rain gauges, switches, blinds and lights. The feature of IFTTT to connect with other services of the web like Pinterest, Instagram, Facebook, or Gmail. The server of AmbientWeather.net includes a convenient timeline in order to track the triggered IFTTT applets. The skill of these Ambient Weather systems offers the owners of the private weather station with the facility to obtain real-time as well as information of past weather developed by devices that they have installed at the AmbientWeather.net. You can easily set up the skill to start: Simply say "Alexa-what is the weather report from Ambient Weather". Immediately, this will offer you a weather report of the outdoor, however, you also can request for the weather report of within your house just by asking, "Alexa-please request Ambient Weather on the conditions indoor." Further, you also can request for the report of any particular day, year or month! Simply ask, "Alexa- request Ambient Weather on yesterdays’ weather." Or maybe "Alexa-request Ambient Weather on May month weather." The app of Ambient Weather offers the owners of their weather station that is personal the facility to obtain information in real-time as well as past weather developed by devices that they have installed at AmbientWeather.net website. All you need to do is link the account and start: Simply say “Hey Google, provide the Ambient Weather'...report of the weather” You will receive the weather report of your outdoor.Also, you can request for the weather report of your indoor just by asking, “…the indoor conditions” or you can ask the history of weather of a particular date. Those who are enthusiasts of ‘Smart home’ do note: WS-2902 Osprey which is a weather station of Ambient Weather can be tied within your system of a smart home. This way you don't need to wait until sunset for your lights indoor to get turned on. Then,in case it begins to rain the‘smart’ sprinkler stops to water your lawn. You also can request Google Assistant or Alexa for the weather report of where you live, and not generated from your nearby monitoring station of ‘National Weather Service’ (or NWS). You might think that most weather stations (home based)function like this, however, it's not the case. Although, Netatmodoes qualify, but dug into IFTTT and Samsung Smart Things. Nevertheless, with this, you will let yourself spend about more than 300 dollars just to set up a complete system of Netatmo. This system is able to measure wind speed, temperature, and rainfall. While the ‘WS-2902’ Osprey system is designed with a priority on connectivity. It works with the IFTTT and is Wi-Fi capable, thereby you can easily program the weather events as well as conditions that would have certain actions triggered ina smart home. ‘WS-2902’ is very affordable and this is the best aspect. It costs less than $160 (retail price) and comes along with an instrument collection which measures outdoor and indoor humidity and temperature, rainfall, wind direction and speed, and barometric pressure. There is also a feature which is obtained typically in systems that are much expensive, that is it includes a sensor for solar and UV radiation. The appearance of the ‘WS-2902’is well built. Construction that is sturdy is sadly not common among home-based weather stations within a price range of $200 to $100. Usually, you obtain a flimsier plastic as well as radiation shielding that is placed about the hygrometer/thermometer which mostly obstructs sufficient airflow to avoid high artificial readings. Well, this is not what happens with the ‘WS-2902’. A backlit color (dimensions: 3 inches of height by 6.75 inches of width) large LCD console lets you read the reporting of the instruments easily. However,naming it as ‘color display’ is kind of an exaggeration. The Color is a visual kind of theme, displaying information like the time and date in green, information of the indoor climate in red, as well as measurements of rainfall in blue (printed). ‘WS-2902’has a few negative characteristics as well: I observed that its readings were a bit less precise when compared with the Davis, for instance. The display console also is quite hard to read if viewed off the axis (just forget about reading it in case you’re greater than 30 degrees away from any orientation). However, I didn’t come across any serious imperfections in the performance or construction. You can view your private weather data available at AmbientWeather.net. The user interface of this website is very easy to understand and use. It works very well using both mobile and desktop browsers. The historical information can be viewed by you for a period of 1 year, tracking by adding of additional devices at Ambient Weather can be done (however you can’t include sensors onto the weather station) and alerts can be set as well as sent via text message or email. Judging by the price tag of the ‘WS-2902’, I was prepared for receiving an average performance. Now, I’m more than happy to detail that the sensor of this station and its connectivity performance have been both performing well over my limited expectations. As a matter of fact, it is one of the best that I have tested within this cost range. It is amazing to learn that the newly introduced 10-in-1 Wi-Fi Professional Weather Station holds a unique look. Other than that, the simple u-bolt mounting bracket is another noticeable feature. The weather station is mounted by sliding it over the end of any pipe whose size is between 1-2 inches. To fit is on a post-manufactured using wood, you need to clamp the pipe in a manner. The array facing outside take in usage 2 AA sized lithium batteries while the one acing indoor takes in usage 3 AAA sized batteries! Remaining functionality is well understood! Going through the manual provided will let you get to know about its feature well. It will be easy for you to operate in an easy manner. Until and unless you know about the operation, it will not at all be an interesting task to operate the same. Feature enriched model leveraging the benefits of technology. Connect your weather station to Ambient Weather Network server to monitor your weather data on you phone, tablet, computer, laptop, etc. You can also send email and text emails. Works with Google Assistant and Amazon Alexa. You can simply say "Ok Google, Ambient Weather" "Outdoor conditions" and it'll provide you all the informations you need. After weeks of researching and compiling lots of data, Our experts found that Ambient Weather WS 2902 is definitely the ideal personal weather station. It’s easy to assemble, build quality is excellent, provides accurate data, plenty of features and much more. It’s one of the flawless weather stations we’ve seen! One feature which i love in this Ambient 2902 is we can use Google Assistant or Alexa to retrieve weather data, that’s cool. Apart from that, it’s a great weather station with lot of other unique weathers like Free weather data hosting on Ambient Server. 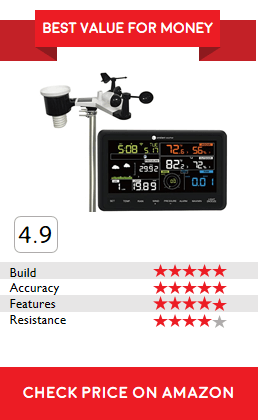 If you want a weather station with high reliability and unique features at a affordable price, this is the one.